It seems like it was only yesterday that Robert Stead from Sense Media organized his first AutoSens conference, but time flies when you’re having fun, and last week it was already the fifth AutoSens show that took place over 4 days in Brussels. 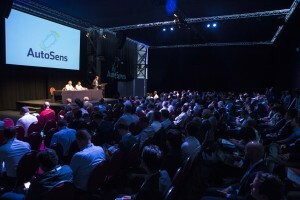 Good energy attracts good people, and the show grew again, not so much in the number of speakers or exhibitors, but in the number of attendees, which grew from 440 last year to 550 this year. We presented a talk titled “How deep learning affects automotive SOC and system designs”, giving an overview of the status of deep learning in automotive and its impact on automotive SOC and system architectures. Let us know if you’d like access to the slides and we’ll send them to you. Once again, the AutoSens Awards were handed out during a very nice dinner and ceremony on Day 3 of the conference. Our own Marco Jacobs won a silver award in the “Most engaging content” category, where EETimes journalist Junko Yoshida rightfully took the first prize. In our show report we give an overview of the key trends we spotted in 2016, 2017, and now in 2018. Hint: it’s all about interior cameras, simulation, invisible sensors, digital mirrors, and ADAS. Augmented reality (AR) and related technologies and products are becoming increasingly popular and prevalent, led by their adoption in smartphones, tablets and other mobile computing and communications devices. While developers of more deeply embedded platforms are also motivated to incorporate AR capabilities in their products, the comparative scarcity of processing, memory, storage, and networking resources is challenging, as are cost, form factor, power consumption and other constraints. 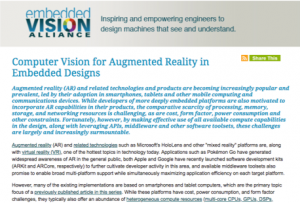 In this collaborative article written together with other members of the Embedded Vision Alliance, we discuss implementation options for delivering robust AR functionality in such deeply embedded designs. 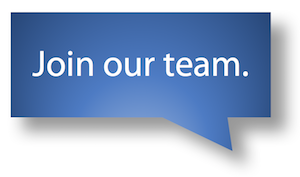 Pssst – we’re still hiring! We’ve added several people to our team in the past couple of months but are still looking for additional stellar hardware and software engineers to add to our staff at our headquarters in Hannover, Germany. Do you think you can keep up with the pace of the rest of our team? Interested in taking on a challenge? Do you have experience in deep learning, embedded processing, low power parallel architectures, or performance optimization? We’d love to hear from you. According to a new report from Tractica, as the diversity of AI applications grows, an increasing amount of AI processing will be handled within edge devices rather than in a centralized, cloud-based environment. Tractica forecasts that AI edge device shipments will increase from 161.4 million units in 2018 to 2.6 billion units worldwide annually by 2025. The analysis indicates that the top AI-enabled edge devices, in terms of unit volumes, will be driven by the following markets: mobile phones, smart speakers, PCs/tablets, head-mounted displays, automotive, drones, consumer and enterprise robots, and security cameras. Last week at Oculus Connect, Oculus’ annual virtual reality developer conference, Oculus announced its latest Oculus Quest VR system. The Quest system is the first Oculus headset that includes inside-out tracking. They use four ultra-wide-angle image sensors combined with computer vision algorithms to perform simultaneous localization and mapping (SLAM). This tracks the headset’s exact position in real time without any other external sensors. CES 8–12 Jan, Las Vegas Come meet with us in our private suite 1830 at the Westgate hotel right at the convention center.